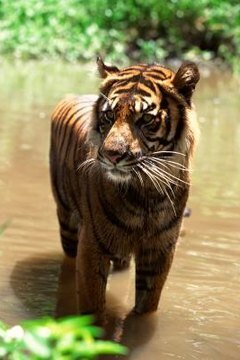 Sumatran tigers (Panthera tigris sumatrae) are a highly endangered tiger subspecies. In terms of physical size, these tigers are the smallest on earth. The rare animals are endemic to Sumatra, which is an island located in western Indonesia by the Malaysian Peninsula. Loss of habitat is frequently associated with the steadily declining numbers of Sumatran tigers. Sumatran tigers are reddish-brown or orange in color, and because of that are usually very adept at blending in with wooded scenery. In general, Sumatran tigers go through their lives alone, with the exception of mating rituals and mother-offspring care. The territorial and nocturnal creatures are carnivores and their diets usually reflect that -- think tapirs, monkeys, sambar deer, crocodiles, pigs, wild boar, fish, birds and orangutans. Sumatran tigers aren't picky eaters, and often scavenge anything that they encounter. Sumatran tigers live solely on Sumatra, as their names convey. Their typical natural habitat includes montane forest, peat moss forest, swamp forest, lowland forest, tropical rainforest, evergreen forest and grasslands. Once in a while these tigers even travel to mountainous regions. Sumatran tigers often remain in spots that have ample dense underbrush, especially when they're near bodies of water. The total population of Sumatran tigers has been in consistent decline in recent years. As of 2008, the IUCN Red List placed these animals in the "critically endangered" category. The Sumatran Tiger Trust reports that it is very likely that not even 400 of the tigers are still roaming free through the wild. Conservation and protection efforts for Sumatran tigers are in full force. A few hundred Sumatran tigers live in captivity internationally, with more than 70 of them in the United States. Habitat loss and destruction are often linked to the severe decrease in Sumatran tigers. The habitat loss is often a direct result of plantation growth and development -- including those for acacias and oil palms. Deforestation also has contributed to the destruction of millions and millions of acres in forest loss, indicates the Rainforest Alliance. The majority of Sumatran tigers reside in protected reserves, although many of them still live in unprotected places, as well.